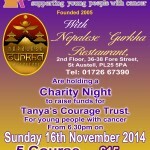 The well-known Nepalese Gurkha Restaurant & Tanya’s Courage are holding a charity night on Sunday 16th November from 6.30pm. A delicious five course buffet for only £15 per head! Tickets available from Tanya’s Courage or from the Gurkha Restaurant, 2nd Floor, 36-38 Fore Street, St Austell PL25 5PA (01726 67390) www.nepalesegurkha.co.uk.